Giving Birth in Cambodia – What have men got to do with it? In this blog post Gillian Dalgetty reflects on how men are positively involved during delivery in rural Cambodia. In a recent report on gender-based violence in Cambodia, women were seen as passive in the face of dominant, domineering men. No doubt such men do exist in Cambodia (as everywhere), and that gender-based violence is both prevalent and a construct of gender-based inequalities which occur in all societies. But is it fair to paint all men with the same brush? Obviously no – there are many examples of individuals and organizations fighting for gender equality and the prevention of gender-based violence through the engagement of men and boys – Sonke Gender Justice, MenEngage, and Promundo are just a few. In light of this, we set out to discover what local people and healthcare staff saw as the positive and life-giving in relation to men’s engagement in recent delivery journeys in rural Cambodia. We chose not to undertake a typical study that look for men’s exclusion or lack of involvement during childbirth and the reasons why. Here ‘men’ refers to husbands, fathers, fathers-in-law, brothers, brothers-in-law. Thirty people were interviewed – women who had given birth within the last year, their mothers, their husbands, local village leaders, village health support group volunteers, community centre and district/provincial and central hospital midwives and doctors. We found that, despite common perceptions, men are very active in taking care of their wives, sisters and sisters-in-law before during and after a delivery journey. They were aware of the importance of antenatal care (ANC); organised transport to healthcare facilities; for their wife and relatives such as parents, grandparents and siblings to see support her and the new baby; stayed with their wife and emotionally supported her during the birth; organised for fruit drinks and snacks to come to the health facility during the delivery; arranged transport home and undertook household chores such as cleaning, cooking and childcare so that mum and new baby could rest together. “When we go to the local health centre, there were no staff there. So I dialled the number listed on the wall and got the midwife who asked us to wait. However, my wife was in such pain that I called again and also called the health centre director, who advised us also to wait. But my wife was screaming in pain, I became more nervous so I called the midwife again – she said she would be back soon. I called another midwife, and she referred me to a third midwife! I called her but she didn’t pick up so I called to the director again, twice. Finally, around late noon two midwives arrived. I helped my wife into the birthing room, and the midwife lifted my wife’s head onto my thigh – I sat on the mattress and the midwives sat below us (on a chair lower than the bed). She finally gave birth in the early morning but was bleeding so much. I was worried and asked for her to be referred to a higher level hospital: about 3 hours later the ambulance came. When we reached the hospital, the doctors rushed to us, bringing a wheelchair – I carried my wife from the ambulance and placed her in the wheelchair and drove the wheelchair to take my wife to the emergency room. The staff asked me to stand and squeeze the PIV bag (peripheral intravenous line, a small, short, plastic tube) while they gave her oxygen. The on-duty staff couldn’t operate and were about to transfer my wife to another hospital – that could have been costly so I called the old doctor. Luckily, she came and assured us that everything would be fine and I calmed down. She knew how to stop the bleeding. After that, my wife rested and improved”. “This was my first baby. I went regularly for ANC at the local health centre: I told my husband about the dates and he reminded me, and borrowed my father in-law’s motorbike to drive me there and back. On the day I gave birth, I had strong labour pains in the early evening and my brother-in-law took me to the health centre – he was waiting for the call. My husband bought bananas and fruit juices for me to eat and to drink during labour so that I would be stronger during the delivery. In the morning, my husband bought rice with fast food at the market for us as breakfast. All morning, I had labour pain and at noon, my brother in-law brought us lunch. I still had pain so we asked for a referral letter (from the local health centre to the higher level hospital). My father in-law drove me to the district hospital because he said my husband wasn’t skilful enough! My mother and mother-in-law came too and they stayed in the delivery room with me and my husband. However, my husband only came in for a short time because there was another pregnant woman inside the delivery room [and we were afraid that she would be embarrassed by his presence]. After my baby was born and we left hospital, there was a flood surrounding my house. My father and my father in-law drove the boat to pick me up and my father carried me from the boat to my house. My husband, mother and father in-law carried our luggage and other stuff”. “I worked at a factory and came back my home town at the end of my pregnancy. I had swollen legs and face (preeclampsia) a week before, so went to the local health centre and they referred me to the higher level hospital to reduce my blood pressure. My husband took 10 days leave from work to care for me. [During the stay at hospital] my husband returned home every night to prepare and bring meals for us. When my blood pressure reduced, I was discharged from the hospital. Two nights later at home, I had labour pain. We arrived at the hospital in the morning and my husband prepared the ward bed and then went to buy coconut juice for me. At noon, my brother brought me lunch. We asked him to prepare food because he knew how to cook a ‘sweet’ soup. Afterward, he brought meals to us at lunch time. I asked my husband to invite my sister to stay with me in the hospital because I was afraid that my husband wouldn’t be allowed to enter the delivery room. He was disappointed – he really wanted to be with me. The baby was born in the early morning. After the delivery, my husband carried me in his arms back to the ward. I couldn’t walk. My baby cried and I had no breast milk so my husband bought formula milk for my baby. I discussed with my husband about what to do when our baby cried. My brother kept bringing us meals. In the hospital, my husband took care of everything. 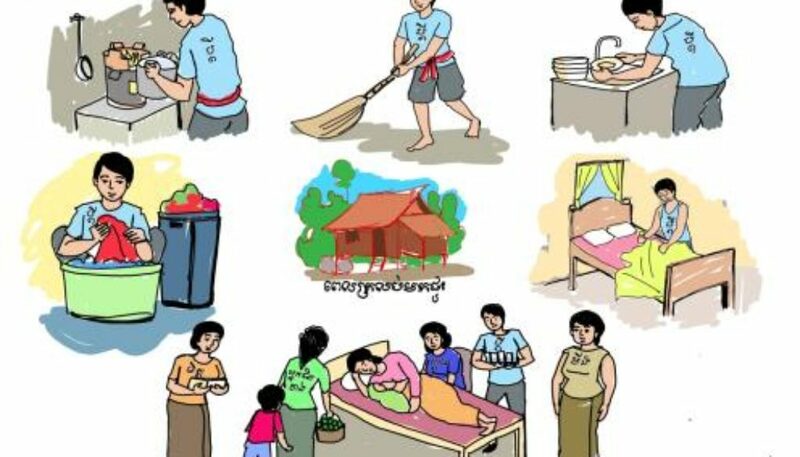 [And] when we arrived home, my husband extended his leave so that he could wash my clothes and clean the dishes”. These stories may go against the common narrative of men’s lack of (and sometimes inhibitive) involvement during childbirth typically found in low and middle income country settings. We aren’t claiming that every man in Cambodia is wonderful – but we are saying that positive role models can be found, and are played out every day. Men play an important role in women’s delivery journeys, and indeed many of them are actively engaged in ensuring the women in their life receive appropriate and quality care. By looking at the positive ways men engage we can question and challenge dominant constructs of masculinity and explore ways men are currently working towards achieving gender equality. This research was funded by the ReBUILD Consortium. Gillian Dalgetty is a Research Fellow at the Leeds Institute of Health Sciences at the University of Leeds. How to do gender analysis in health systems research – Significance of data collectors’ gender (part 2)	Incorporating gender into ethics reflections when conducting health systems research…. Where to begin?